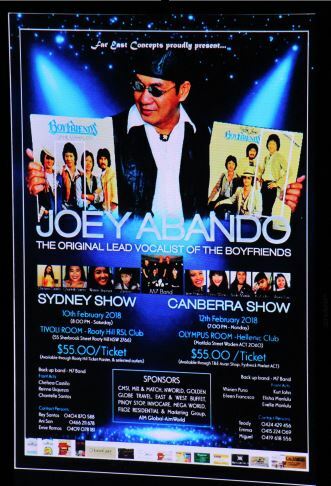 ​Joey Abando, the legendary member of the Boyfriends Band which was a pop and disco band in the late 1970s to early 1908s, came to Australia this week and performed in front of large packed out crowds in Sydney and Canberra. RFA caught up with Joey after his awesome performance in Canberra which saw the crowd cheering and clapping throughout. ​He still has his suave showman's touch which doesn't seem to grow old. The Filipino Boyfriends Band, which made Joey a legend, was famous for its pop and disco harmonies that were reminiscent of the internationally famous Bee Gees band, made up of British born singers who migrated to Australia and became global chart topping legends after launching their pop career from Redcliffe, Brisbane, Queensland. The Boyfriends Band was one of the most popular bands of the Manila Sound music period in the late 1970s. Manila Sound is a musical genre in the Philippines that began in the mid-1970s in Manila. It became huge in the mid to late 1970s, and has not waned in popularity to this day. It has influenced all modern genres in the country by being the forerunner to Original Pilipino Music (OPM). In the later period of Manila Sound, disco mania swept the Philippines, led by groups such as the Boyfriends and Hagibis, among others. Hagibis, considered the Philippines' and Asia's answer to the American Village People will be performing in Australia next month). Alternately described as "the marshmallow sound", Manila Sound generated a string of calculated radio hits. Manila Sound's unprecedented and meteoric appeal provided viability to a Philippine recording industry that until then had relied on cover versions and imitation of foreign hits to entice consumer acceptance. 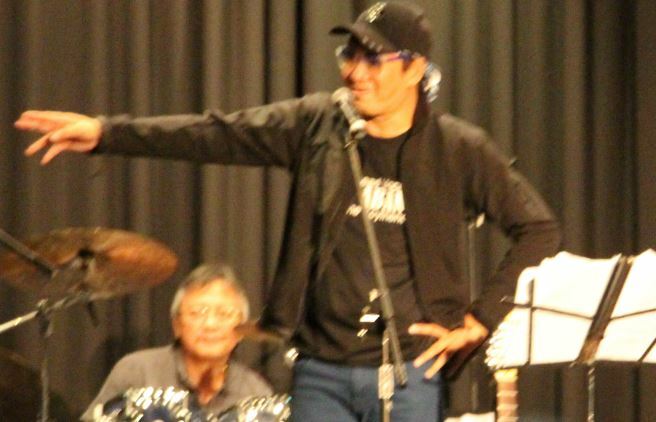 Manila Sound's laid-back and unpretentious musical style gave way to the intricate, multi-layered, and sometimes symphonic arrangements of OPM that dominated popular, radio-friendly Philippine music starting in the late 1970s up until the 1990s. OPM, spawned initially and heavily influenced by the annual Metro Manila Popular Music Festival, emerged as radio favorites. The Boyfriends Band was particularly famous for the song "Sumayaw, Sumunod" which became a big disco hit. They also released the disco songs "Araw-araw, Oras-oras" and "Dance With Me", and the love ballads "Nais Kong Malaman Mo", "First Love", and "Bakit Labis Kitang Mahal". Joey Abando has not lost his touch, and neither has Manila Sound which is still in hot demand around the globe wherever Filipinos gather.